Shipping R85. Free shipping for orders over R2000. 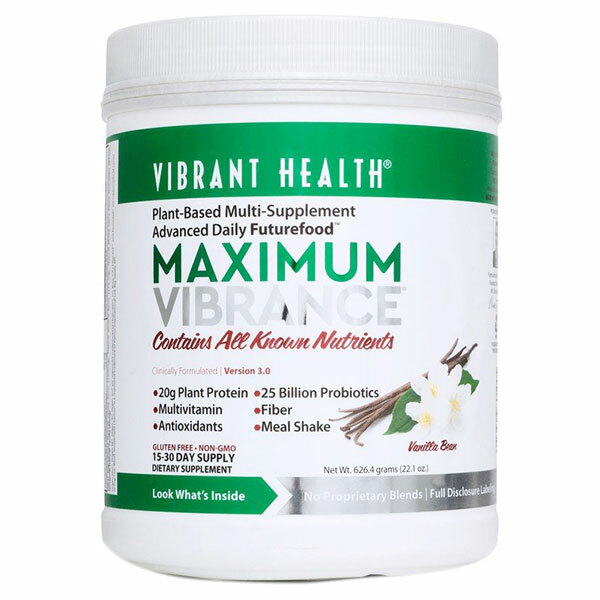 Maximum Vibrance delivers a meal’s worth of high protein plus a dose of multi-vitamins, antioxidants, enzymes, and probiotics to increase vitality, energy and achieve optimum health. 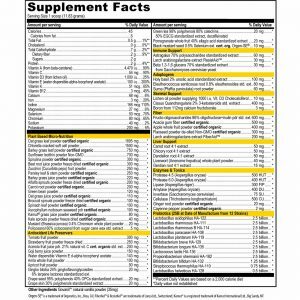 Maximum Vibrance comes closer than any other dietary supplement to being the singular product one may take in place of all other supplements. 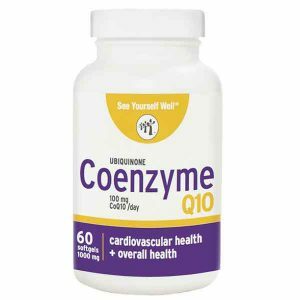 The only essential nutrients absent from the formula are essential fats, in particular the omega-3 fatty acids. Technology has not yet developed a stable form of powdered omega-3s or other healthful fats that possess a shelf life suitable for use in powdered supplements. Maximum Vibrance delivers a meal’s worth of high protein, plus a Paleolithic dose of micronutrients, meaning Maximum Vibrance will feed the human body a broad range of vitamins, minerals, polyphenols, and bioactive food substances at levels that closely match the high requirements of our ancient, Paleolithic biochemistry. We are programmed to need more micronutrients than our modern food can supply. When we don’t get enough of them – and there are thousands – biological systems falter or may break down entirely. Immunity, growth, maturation, healing, cardiac health, skeletal health, and a broad number of body systems may begin to function poorly. Maximum Vibrance prevents that from happening, and preserves human vitality. 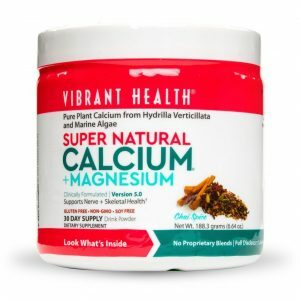 Maximum Vibrance marries fully balanced vegetable protein to certified organic vitamins and minerals of plant origin, and then blends them into a mass of specially selected and certified organic plant foods that provide a complete array of nutrients necessary for optimal health. Astaxanthin, lycopene, beta-carotene and a host of botanical extracts push the protective antioxidant power of Maximum Vibrance to, well, maximum levels. 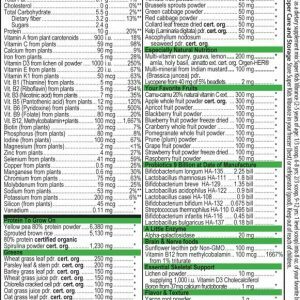 The organic cereal grass juice powders, spirulina, ample chlorella, vegetables and fruits deliver broad nutrition and effective detoxification. 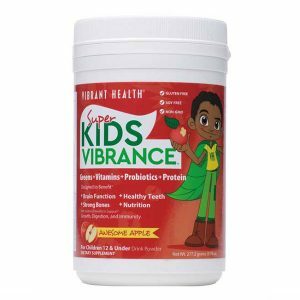 Our classically powerful blend of 25 billion probiotics per serving, from 12 strains of beneficial bacteria, are here, too, just as they are in Green Vibrance. Use two scoops (enclosed in the jar) for a complete meal replacement or one scoop for a nutritious snack. Either way, the pleasant taste of Maximum Vibrance permits its use in any beverage from water through juices to almond milk, or any smoothie. 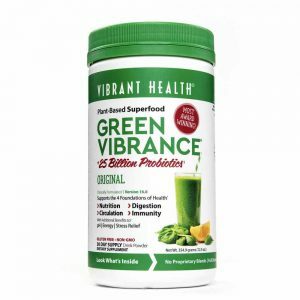 Maximum Vibrance contains over 100 ingredients that include extracts and whole powders from 80 different plants, 29 antioxidants, 3g of fibre, 7 servings of fruits and vegetables, 7 vegetable based digestive enzymes, 20g of protein and so much more! 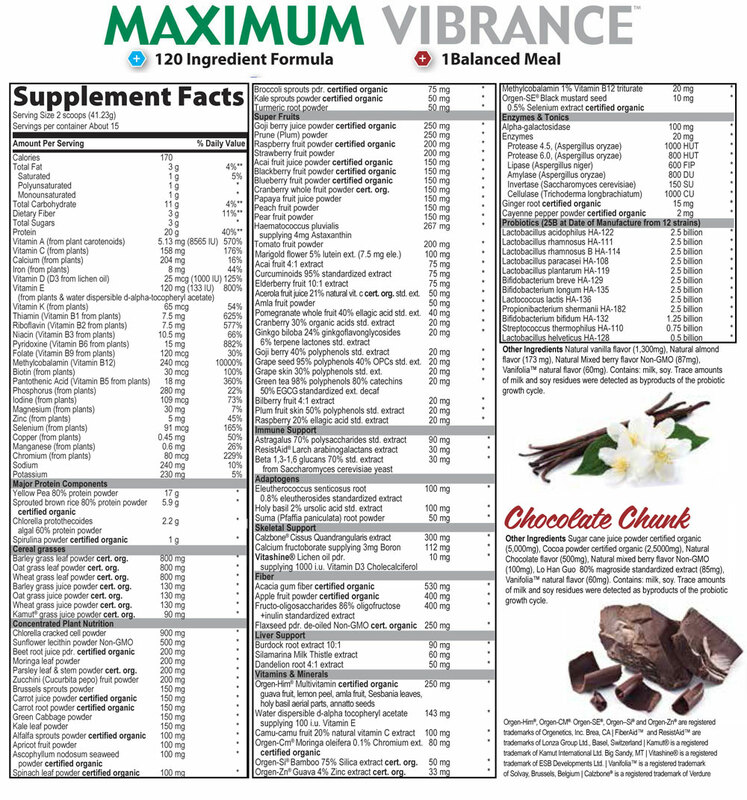 Maximum Vibrance is the most comprehensive nutritional multi-supplement you will find anywhere in the world. It’s more than a super food, it’s a Futurefood!